OMEGA’s HHF91 digital anemometer is a versatile instrument for measuring air velocity, calculated air volume flow, and air temperature. Special features include the ability to switch between FPM/°F and m/sec-°C and an AUTO-OFF function that engages after 20 minutes (the AUTO-OFF function can be bypassed for continuous operation). The HHF91 can indicate average, minimum and maximum readings, and includes a hold button to freeze the display. It can also be reprogrammed with the keypad to read in either FPM/°F or metres/sec-°C. The kit is supplied with one handheld readout with attached velocity probe (0.9m cable), one 9 V battery, and one carrying case. Velocity: 2% of full scale from 200 to 4500 fpm. 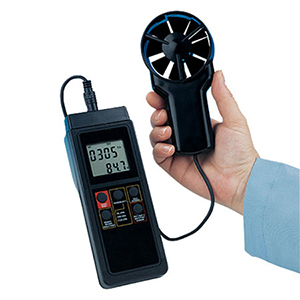 Nota: The HHF91 anemometer kit, supplied with one handheld readout with attached velocity probe, one 9V battery, and one carrying case.